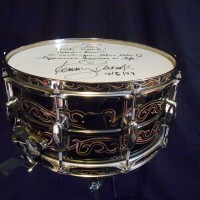 This drum is #22 of 100 only drums in this model ever made. This model sold out many years ago and is no longer available in stores. 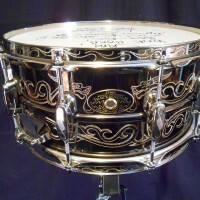 The drum is near new condition. There may be some fingerprints and a few spots of extremely minor scratches but that is it. No flaws, nothing broken missing or damaged. 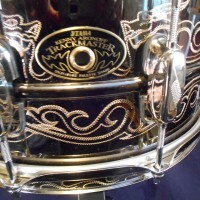 The shell, hoops and lugs on this Limited Edition Kenny Aronoff Signature Trackmaster model snare are hand engraved with Kenny’s exclusive dragon pattern. The custom name plate that was to be engraved with the buyers name was never engraved and could still be engraved with your name. 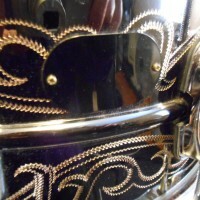 The shell is 1mm brass plated in black nickel. 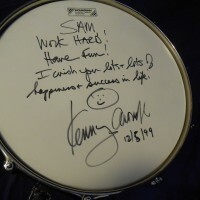 Includes signed head (acquired separately) and red TAMA “Signature Pallet” cloth bag.